For artist Sharon Nowlan, it all started with a handful of pebbles. Her son collected a handful of pebbles at the beach one day and brought them to her in her studio. They were like treasures and she knew she had to make something special with them. She created pieces of art which can be offered for special relationships or to celebrate milestones. The meaning of each can be open to interpretation making it personal to the giver and the receiver. The wood frame is textured with an easel back, gallery quality matte board, shadowing effect adds dimension and each piece includes a copy of the artists signature. 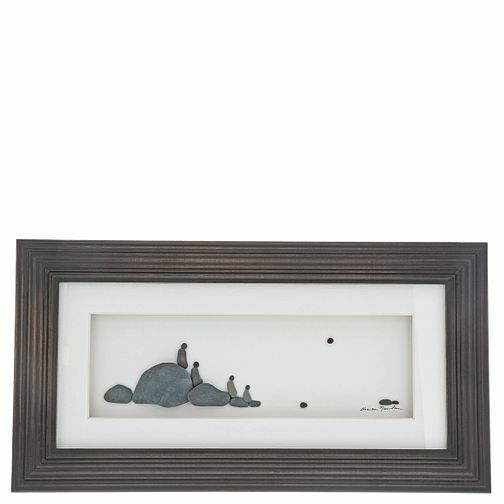 The 'Four of Us' framed picture features a family of four sitting on the rocks, watching the beautiful sunset. Frame is 20cm x 38cm and comes packaged in a plain white box.